Update: A review has now been added. 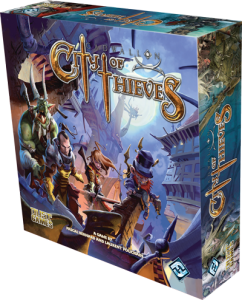 Cadwallon: City of Thieves has been on my radar for a while now – since just before FFG took over the publishing and their usual planned previews have raised its profile a lot more. 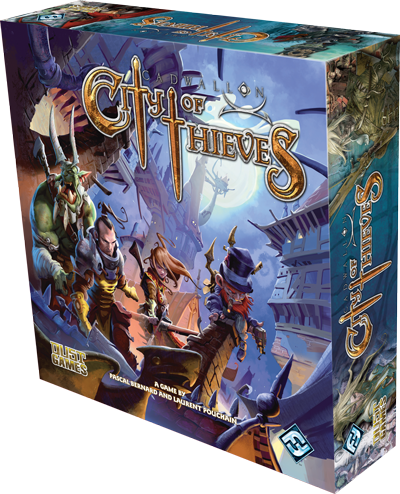 Set in a fantasy setting, players allocate action points to move their thieves around the city to steal as much as possible from locations and from each other. Players can block each other’s paths and even influence the militia men to slow opponents down. Sounds like it’s a light-to-medium weight game but with enough to it to be good fun and plenty of racing against other players and scope for annoying opponents too. There are adventure cards which set specific objectives, set-up, rules and events for each game, plus there are mission cards too which deliver bonus money if fulfilled. So, each game should have its own flavour. 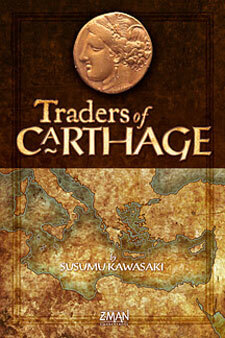 Traders of Carthage is essentially a card game but does include a board. Each of the cards shows one of 4 different commodities (red, blue, yellow and green) and has a coin value from 1 to 5 on it. Next to the board are two rows of face-up cards – one is the Market (these cards can be bought or taken) and one is the Field (which are cards that will soon be moved to the Market). The board depicts a trade route passing through 6 Mediterranean cities along which 4 ships – one for each commodity – will travel. Get coins: The player can add any 1 card from the Market to their hand (excluding any card with another player’s reserved marker on it). Reserve a card: Each player can place their reserve marker on any unreserved card in the Market or the Field. It can only be retrieved by taking the reserved card (Get coins), or by buying the cards (Buy goods). Buy goods: A player can spend coins (the cards in their hand) to buy the cards in the market; however, the player must buy ALL of the goods cards in the market or none at all. Purchases must include any good in the Market that the player has reserved, but exclude any goods reserved by other players. Any goods bought are placed face-up in front of the player – these are the player’s shipment. After a purchase, the ships matching the colours of the cards bought are moved along the trade route (1 space if one card of that colour was bought, 2 spaces if more than one was bought). In my blog and Tweets I’ve mentioned I have some new (and exciting features) that I shall be adding. The first are described below, but I also have two bigger items to announce in the next couple of weeks. Since I started posting boardgame reviews in October 2010, I’ve noticed I describe the game and how it is played more and more – I think this is the game explainer in me which is one of my natural roles at games events. To comment on a game, it’s important that the comments are in context for readers, but I’m thinking of cutting down the amount of game description I include in new reviews. One reason is that describing a game in detail takes longer than the writing my appraisal of the game. Also, less detailed game descriptions will make it easier for me to review more games, still convey the same assessment and comments, and make it easier for readers to consume. If you have any opinion on this, let me know. Writing a full review is great and I certainly won’t be stopping that at all; however, there are times when I just want to give some thoughts on a game, so some posts will purely be Shorter Thoughts. I had thought of using Twitter but it’s so hard to fit fair and balanced comments into 150 characters. When new games get announced some really catch my eye and I want to highlight them. So, I shall be trying out adding posts which are purely games that I think look promising. That’s it for now. Thanks for reading my blog and Tweets on @Metagames if you follow that too. Egizia was a game on my list to check out at Essen in 2009. I would even have taken a punt and bought it without playing it first but the text on the cards was in German. So, I played it soon as I had a chance a couple of weeks ago when the English language version was released. 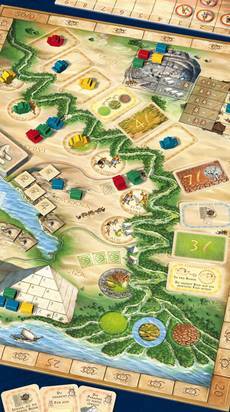 Set in Ancient Egypt, players try to gain as many victory points (VPs) as possible over 5 rounds. Each player has 8 ships and, in turn order (the player with fewest VPs goes first), players place their ships one at a time on spaces along the Nile following two important rules: first, only one ship can be placed on each space and, second, a player can not place a new ship upstream of any of their ships that they have already placed.